Director O Muel, who previously made independent war drama sensation Jiseul, got down to his new film’s production. The Legend of a Mermaid (working title), which started shooting on 3 September, is about a former national synchronized swimmer who teaches underwater performance to a woman diver in Korea’s Jeju Island and gradually gets to understand the life of women divers more, which changes her mentally. The former national synchronized swimmer Yeong-joo is played by singer turned actress JEON Hye-bin, while MOON Hee-kyung plays the Jeju-based woman diver, Ok-ja. Originally a Jeju-grown actress, MOON Hee-kyung participates as a talent donor. In addition, actresses SUN Woo-sun and KANG Rae-yeon, and comedian KIM Hyun-chul are also on board. Since O Muel, who is also a Jeju man, has made films about Jeju, the whole island is paying attention to The Legend of a Mermaid. O Muel debuted with Nostalghia in 2011 and made the awards winning war drama film set in Jeju Island, Jiseul. Jiseul received the Cyclo d'Or from Vesoul International Film Festival of Asian Cinema, a special mention from the Human Rights in Cinema Competition section at Istanbul Film Festival, and the grand jury prize from the Sundance fest’s World Cinema Dramatic Competition. “O has crafted a potent and poetic requiem for a people and a place close to his heart,” wrote the Sundance Film Festival website. Jiseul was the first Korean film to win the grand prize in the category. 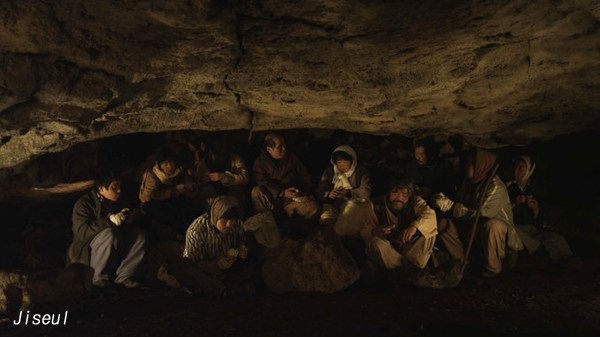 The artistic black and white work tells the story of a group of some 120 Jeju islanders who hid from soldiers in a cave during the 1948 Jeju Massacre, which resulted in almost 30,000 islanders’ death. Meanwhile, "team mermaid" recently held a rite in Jeju, wishing a smooth production.